A fresh take on the traditional Bay Rum product for men. Bay Rum is a fragrance that's been used for centuries in fine aftershave lotion and shaving soaps. West Indies bay leaf, spices, and Jamaican rum combine to give the Bay Rum fragrance its distinctive woody, sweet, and spicy scent. Ours is a lighter, fresher version, more suited to a Chris Craft Cruiser than a Scallywag's Ship. Discover the intoxicatingly spicy and ultra-manly scent of Back Bay Rum! Cloves, cinnamon, patchouli, pine, musk and vanilla, with lighter top notes of citrus and chardonnay! It's a great beard soap, as well as a super creamy shaving soap! If you've ever enjoyed a Rum Runner (or a fine cigar, craft beer, or a midnight cruise) on Wolfeboro's Back Bay on a breezy summer evening, you'll enjoy Winnipesaukee Soap Company's newest offering, Back Bay Rum. The scent is delicious, seductive, masculine... what a "civilized man" should smell like... to distract from his plundering, free-booting ways! As refreshing as a summer breeze off the lake, as exotic as an island spice! If you like Bay Rum... you'll LOVE Back Bay Rum! This blend is spicy and rich with clove, cinnamon, orange, patchouli and more! for that spice scent men love (and women can appreciate too). A straightforward option for discerning gentlemen... and tricky pirates! Soul Shine offers up a deliriously happy fragrance of peach, citrus and a hint of absinthe to transport you to your happy place! Ground oats and sea salt are added to make sure your skin glows as brightly as your soul! All of our signature cold processed soaps are formulated with a blend of Olive, Coconut, Soybean and Hemp Seed oils. Unrefined Shea butter is added at the end of the process to provide extra moisturizers. This combination of oils and butters produces a gentle cleansing bar of soap rich in lather and bubbles which is suitable for all skin types. We use all natural ingredients including infused essential oils in our soaps. 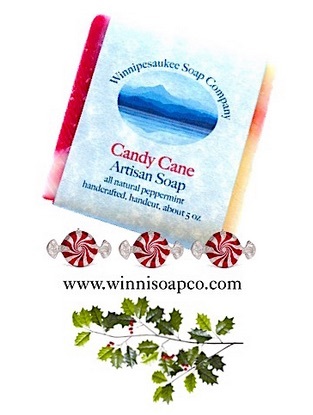 Winnipesaukee Soap Company bars contain no preservatives, no petroleum products, and no parabens. Natural ingredients give you soft, smooth, and wonderfully scented skin. Once you try our artisan soap you won't want to go back to using commercial soaps that are filled with ingredients difficult to pronounce and unhealthy for your body. Think of our soap as a vacation in paradise for your skin! "let your soul shine, it's better than sunshine, better than moonshine... damn sure better than rain!" Buy a bar of Soul Shine and hit all the "right notes." Winnipesaukee Soap Company... we'll take you to your happy place! Nature's Cure For That Oozy Itch! Stop the itch of Poison Ivy, Poison Oak and Poison Sumac. Fast, effective relief from oozy itchy rashes! The Jewelweed plant has been used for centuries in North America by Native Americans and Herbalists, as a natural preventative and treatment for poison ivy and poison oak; and is a folk remedy for many other skin disorders . When used immediately after exposure it will prevent the rash by removing Urushiol, the oil that comes from poison ivy plants. Jewelweed Stop Itch Soap is effective for people and pets! Our combination of rich lavender and brisk mints is calming and exhilarating... much like your early morning paddle when the lake mist rises from still waters. You're alert and your senses are invigorated, yet you are relaxed and at one with the natural word... at peace. Lake Mist will take you to your happy place! With just a few squirts, Lake Mist spritzes away chaos and stress leaving you in a misty, mysterious, enchanted paradise - feeling a bit euphoric - with focused calm. Spearmint and Peppermint essential oils pick you up while Lavender sweetly soothes. Lake Mist is naturally scented with pure essential oils of French Lavender, Spearmint and Peppermint which creates balanced floral, and slightly woody herbal scent that appeals to both men and women. Together these oils produce a rich, calming yet invigorated effect that couldn't be more perfect. Lake Mist is fresh, clean and calming... we cannot get enough of this! A Little Something Special For You! At Winni Soap we create healthy, joyful connections to your happy place... the natural beauty and fragrant breezes of the lakes, streams, mountains, forests and meadows of New Hampshire. We invite you to reconnect with all that nourishes your body, mind and spirit - simplicity, goodness, and nature - wherever you may be today. Return to your Happy Place and take 15% off your next Winni Soap order. Simply use code WINNI15 on our online shop thru January 2017. Free US shipping, too! "Peace Tree" is simple, green, and made with love! Our new signature bar for 2017 is reminiscent of a lush Northern forest after a spring rain. Fresh. Calm. Inspiring. Alive! Just sweet enough, all green - but not overly earthy. "Peace Tree" is a clean, "outdoorsy" scent that everyone will love!! Inspired by the Peace Tree project in which students and families create peaceful and inclusive schools and communities by exploring all our vibrant cultures and ways of life through the arts and literacy… We are encouraged to take action and ‘be the change we wish to see in the world’; to get involved in social justice initiatives by discovering our passions and using our imaginations through an exploration of diversity to help children less privileged while creating peaceful, inclusive, and equitable schools, communities, cities and countries around the world! 100% of the profits of the Peace Tree bars support these programs for disadvantaged kids! Ingredients: Olive Oil, Coconut Oil, Soybean Oil, Hemp Seed Oil, Organic Shea Butter, Water, Lye, Sea Salt, Oatmeal, Natural Oils and Natural Colorants. Each hand-cut bar weighs about 5 ounces, and measures 3 x 2.75 x .75 (+-) inches. 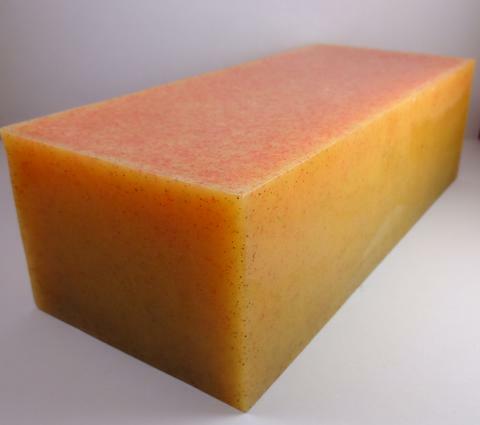 Due to the handcrafted nature, every cured bar of soap will have its own unique appearance, which may vary slightly in color, shape and weight. To extend the life of your soap, keep in a well-drained soap dish and allow to dry between uses. Win a $50 Gift Card Today! Made-to-order soap loaves are available for a limited time! For a limited time we are taking orders on loaves. You may choose from over 25 varieties, even seasonal offerings. Plan now for holiday giving! Create beautiful, one-of-a-kind gifts! Handmade soap is wonderful when wrapped in fabric and tied with a festive bow. 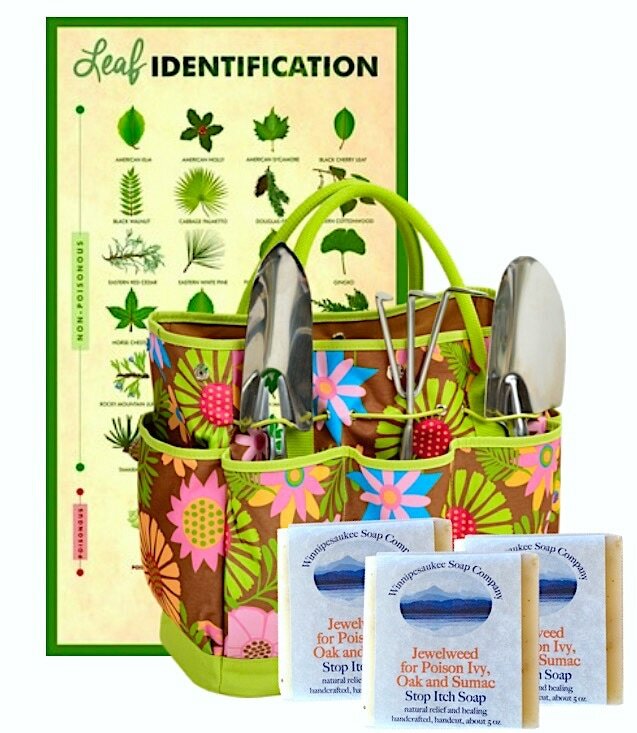 Or, let us create a custom label for you to share with your most special friends - and you'll give a gift as memorable as a perfect day at the lake! • 2 lb 12 oz loaves. Loaves measure approx. 9 x 3 x 2.75". • Each loaf yields eight 5 oz bars ( approx 3 x 2.75 x 1" each) plus ugly ends. We will cut the bars for you unless you ask us to ship the loaf uncut. • We'll even create a custom label for you and email it to you as a PDF file for you to print on parchment paper at home. Wrap each bar with a personal touch - create an invitation, a business thank you, a party favor, or a holiday greeting... just let us know what you'd like to say! Click on the photo to place your order. Please allow 6 - 8 weeks for delivery. You've heard of "Buy a Brick" fundraisers that are used to create the foundation of a new project... "Sponsor a Stump" is much the same idea, but instead of paving a pathway or building a wall you'll be helping to create a dynamic learning space in the new Earthkeepers Enrichment Center at New Durham Elementary School. 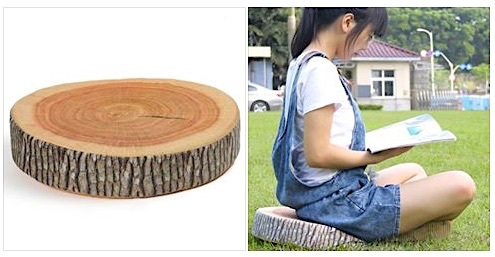 These "stumps" are actually floor cushions, perfect for "active sitting." We're in the process of creating a beautiful learning space that will bring the outdoors in, and a circle of these floor cushions will be just right for reading, singing and sharing ideas! Active sitting is based on the idea that it’s not healthy for the body to be seated in chairs for long periods of time. Too much sitting still has been shown to lead to back and hip soreness, fatigue, decreased muscle tone and ﻿a lack of focusing ability.﻿ Active seating corrects these problems by promoting slight movements and adjustments for the user while they sit. These movements keep the body more engaged, alleviating the negative effects of prolonged sitting. Improved posture and muscle tone – At the same time the student’s frequent postural adjustments strengthen the core abdominal and trunk muscles. Sensory input and energy burning – Some kids just gotta keep moving! Their muscles crave activity, making it difficult for them to sit still for long periods of time or focus on seated activities. Because active seating lets kids move and adjust themselves in a non-disruptive way, they burn off excess energy and get the stimulus their muscles are looking for, making them more attentive in class. Increased blood flow – As a child moves during active sitting, the heart pumps a bit faster and blood vessels in the legs and hips open up which increases blood flow. Better blood flow means more oxygen gets to the brain. With more oxygen, brain function increases, allowing for improved focus and better knowledge retention. These wonderful floor cushions will create fun and friendly "active seating" around the campfire in our indoor outdoor classroom! Each cushion is 15 inches in diameter by 3 inches thick. The covers are made of durable, washable twill that zip on and off a dense foam pillow. You can sponsor a stump for just $12 by clicking on the widget below! Thank you! Please help grow the Earthkeepers Program! The Earthkeepers began as an after school enrichment program for educationally disadvantaged students in grades 1 - 6 at New Durham Elementary School in January 2015. 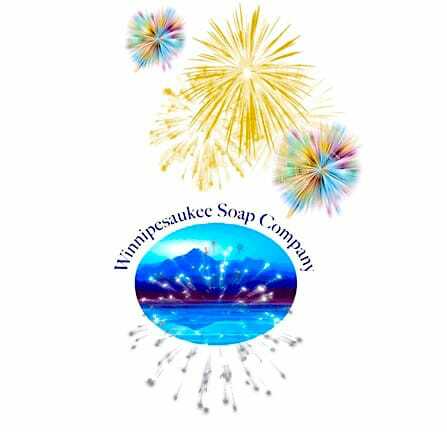 It was a crowd funded project with support from patrons of Winnipesaukee Soap Company, and local and summer residents. • The Earthkeepers have designed and installed a Butterfly Garden, a Buddy Bench, an Outoor Classroom, 3 Literacy Pods, and a sand play area called "Imagination Station" on their playground at New Durham School (NDS). • The Earthkeepers have created a school culture of excellence, kindness, inclusion, and stewardship through their after school program projects. They are proud of their academic successes, and celebrate accomplishments outside traditional academics. Their positive energy is infectious! They are peer leaders. • The NDS classroom teachers, administrators and parents wholeheartedly acknowledge and support the positive impact The Earthkeepers have had on the school culture. • The "Earthkeepers Enrichment Center" has a nice ring to it. • We have an opportunity to expand the Earthkeepers program to include all students at NDS by creating the Earthkeepers Enrichment Center. We only need to raise the funds for staffing for the 2016-2017 school year!